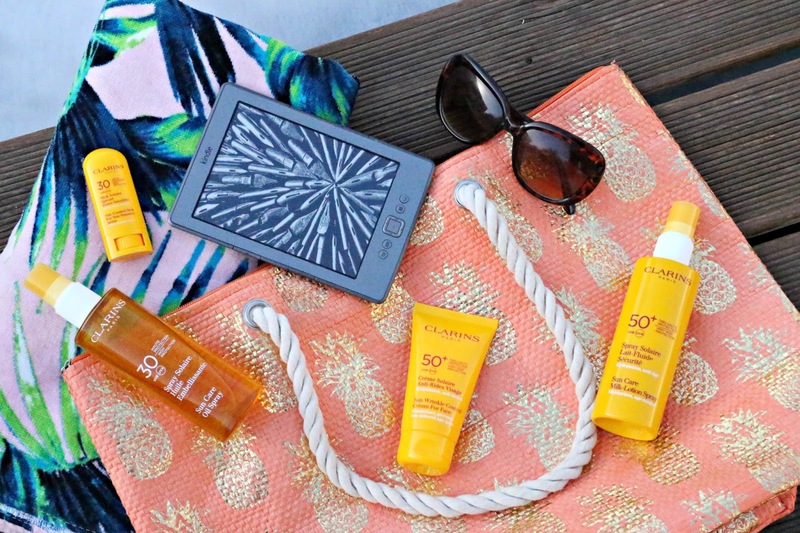 Clarins Sun Protection: My Fave SPF for winter & summer sun! My favourite beauty counter to shop at for SPF is, and probably always will be, Clarins. Their multi award winning sun protection products have the most delicious, light exotic fragrance that instantly relaxes me and transports my mind to far away shores whenever I smell it. 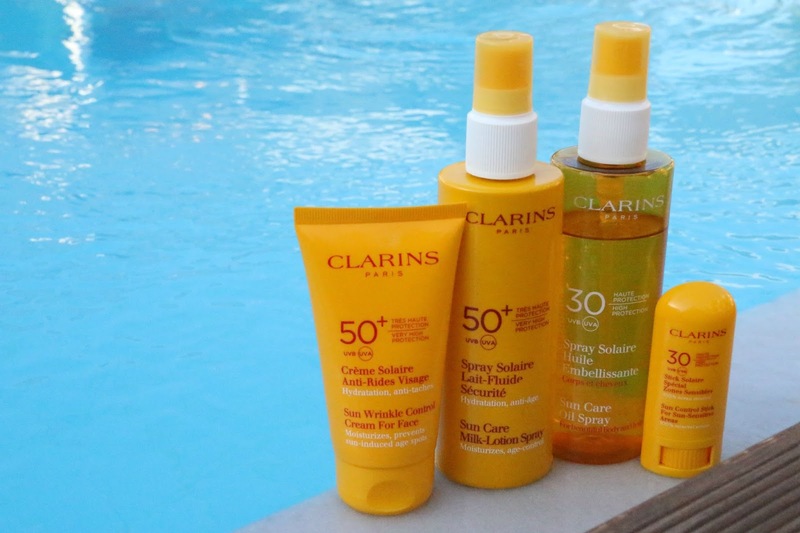 I’ve lost count of the amount of bottles of Clarins Sun Protection that I’ve gone through over the years and while I do test out other brands from time to time, I’ve remained loyal to them as a brand; I’m a Clarins girl through and through! Travelling is my favourite thing to do in life. I’m not materialistic; experiences are what matter to me the most so I love to save and spend my money on going on holiday, seeing the world, learning from new people and relaxing. The more years that I spend self employed, the more I am realising the importance of setting and maintaining a work/life balance and holidays in the sun definitely help with that. 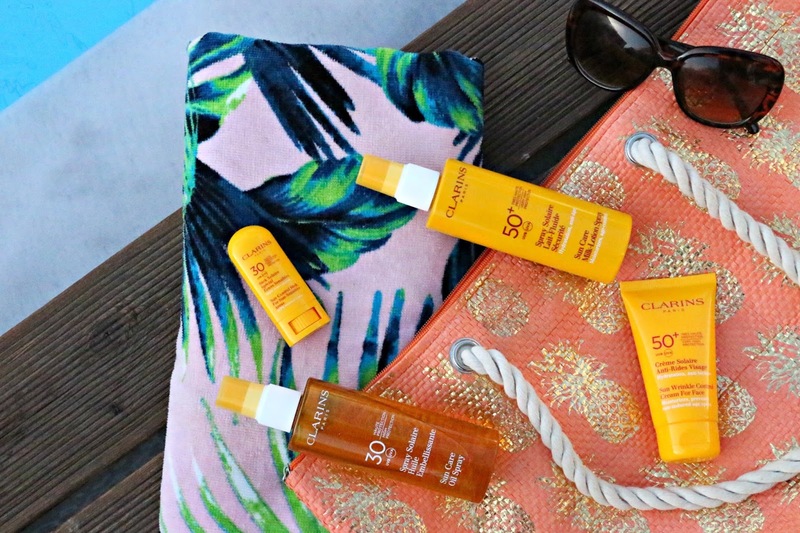 When I’m lying out around the pool or at the beach, I like to opt for an oil formula for my sun protection. Getting a deep, golden tan on my body is desirable to me but protecting my skin from the evils of sun damage is of greater importance. 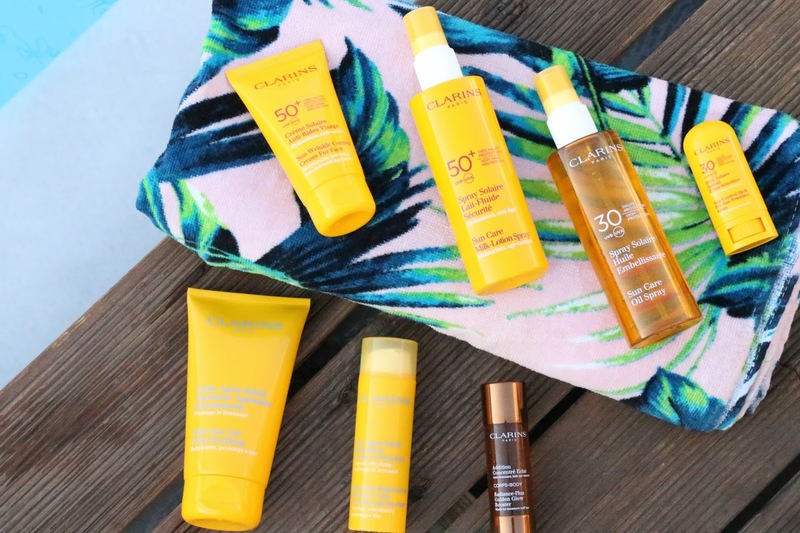 By choosing the Clarins SPF 30 UVB UVA Sun Care Oil Spray for beautiful body and hair, I get the best of both worlds; an incredible tan with thorough sun protection. Plus, its water and sweat resistant which is great news for me when travelling to hot, far flung destinations. The Clarins Sun Care Oil comes in a medium protection in an SPF 15 and a high protection as an SPF 30, the latter of which is the one that I always use regardless of where I’m going. The high factor doesn’t mean that I’ll tan any less, it simply means that I can be in the sun for longer before risking burning and I therefore need to reapply it less frequently. The dry oil formula is lightweight, very easy to apply as its clear and smoothes into the skin effortlessly and it absorbs into the skin quickly too. Oils are my favourite formula of SPF because they tend to leave my skin more hydrated which I find helps me to gain a deeper tan. This one feels delicious on the skin and gives it a perfected look; glistening without being greasy. Made up of sun filters, along with gold cob, sycamore, healing aloe vera, organic Nyamplung oil from a sacred Indonesian tree, it is a unique mix that leaves the skin feeling and looking hydrated, perfected and protected poolside. It comes out clear from an easy-to-use spray bottle and can be applied all over the body and even into the hair, however I would avoid the face and opt for a face specific SPF instead. There’s a few to choose from at Clarins which I’ll come onto later in this post. Before that, I really want to tell you about another formula from Clarins and that’s the body lotion variety. The high protection, Clarins SPF 50+ UVB UVA Sun Care Milk-Lotion Spray is my go-to for days when I’m out and about, be it strolling around a market on a holiday day trip abroad or taking a walk in the sunshine back in the UK. The Milk-Lotion formula is lightweight, easy to apply from the spray bottle and fast absorbing. I spritz it on and quickly rub it in and it doesn’t take long to absorb at all, meaning I can get dressed and head out into the sunshine quicker than other SPF lotions I’ve used in the past. It leaves my skin feeling so nourished, soft and supple, just like a body lotion would but it provides incredibly high SPF protection too. My skin doesn’t feel clogged or greasy when I use it and just like the oil, it enables me to achieve a deep, dark tan with a dramatically reduced risk of burning. I always follow reapplication advice and try to take regular breaks in the shade but a high quality, high performing SPF like this one is essential for me. You’ll also find a formula with the same sun protection factor but specifically created for children’s skin, as well as an SPF 20 which also contains power ingredients such as aloe, baobab, olive and kiwi fruit for moisturisation and regeneration. Aloe in particular is a fantastic skin soother and helps to reduce redness which makes it one of my favoured ingredients for sun care products. If you’re looking for something even more nourishing, then Clarins also offer a sun protection cream in an SPF 20 and 30 which is thicker in formula and while it can be used by all, it is ideally suited to those with skin that burns easily. Whenever I apply sun cream, I always use a separate one for my face, forever opting for the highest factor that a brand offers; you only get one face after all! Using an SPF thats specifically targeted for the face is important because generally they omit or reduce ingredients from the formula that could clog the pores and cause breakouts, etc. There’s ingredients in SPF that work well for the body but aren’t generally suited to the more sensitive skin on our face. High performing facial sun creams from skincare brands like Clarins tend to be best because they also contain skincare like ingredients to nourish the skin while protecting it. The Clarins SPF 50+ UVB UVA Sun Wrinkle Control Cream For Face is my absolute favourite. I’ve used their facial suntan lotions for years and always loved the multi-cellular protection and skincare benefits that it gives my skin. Its highly moisturising, doesn’t dry my skin out or clog my pores and at the end of the day, my skin feels nourished while still achieving a light golden glow. This face SPF prevents sun-induced age spots and is anti-ageing with ingredients such as kiwi, aloe, olive tree and nourishing baobab. It is also available in SPF 15 and 30 which would be great for if you’re in countries where the sun isn’t so strong however if the option of SPF 50+ is on the shelves then I’d suggest going straight for that one every time. All of these are ideal for use during the day when you’re back home from your holiday too. Your skin is continually exposed to the sun when you’re out and about, even in colder weather so its important to protect your skin everyday. My final recommendation to protect your skin in the sun is the Clarins SPF 30 Sun Control Stick For Sun-Sensitive Areas. This is a 100% Mineral Sunscreen that is designed to give added protection to sun sensitive areas on the face that are really exposed to the sun; typically the nose, lips and ears, which a lot of us a prone to burning. The ingredients in this stick are designed to nourish and protect the skin. There’s Centella Asiatica and Vitamin E which limit the effects of the UV generated free radicals that can cause premature skin ageing and mango butter, sunflower wax and shea butter to hydrate and nourish the skin. I love anything that’ll stop my skin from drying out when I’m tanning, especially on my nose and ears as they tend to be areas that often peel on my skin… not a good look. If you’re skiing, doing water sports, going out on a boat trip or exposing your skin to intense heat then this is definitely the SPF for you. Apply your sunscreen all over your body as normal and then run this stick over the extra sensitive areas of your face and you’re good to go. I always try to remember to apply this right before I have a nap when sunbathing because if I don’t, I can guarantee I’ll wake up with a red nose and sunglasses marks! Whether you’re going away for a winter sun break like I know many of you do, or if you’re looking forward to your hols next summer, I’d highly recommend picking up some bottles of the Clarins sun protection to take with you and certainly a tube of the face SPF for everyday use back home. You really can’t beat it. I’ll be posting about my faves from their aftersun range soon so keep an eye out for that post coming up! What formulation of SPF do you like to use? What are your favourite Clarins products? I love Clarins products but some of them are so expensive! I do like the sound of an oil spray though, I prefer products like that. Ooh these sound great! I love that your skin didn't feel greasy, I always worry about using SPF on my face (although I do!) that it will clog my pores and leave me with problematic skin. I tend to stick to SPF moisturisers through the year and then SPF 30 in the summer. I don't think I've ever had something from Clarins I didn't enjoy. I find pretty much everything they put out smells amazing too, which is always nice. Ah I wish I was getting some winter sun right now! It's nice to find a good suncream that works well and is nice on your skin.